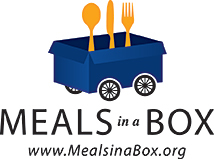 The Newport Beach Sunrise Rotary Club President (Steve Bender) challenged the Irvine Rotary Club President to see who could collect more food and clothing for Homeless Veterans through our “Meals in a Box” and “Suits in a Box” program. The losing club President had to wear a dress to the other clubs meeting. 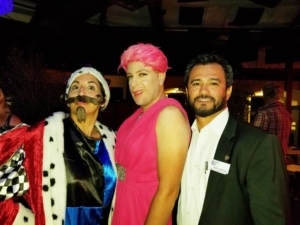 President Ray Benedictus and President-Elect, Anabella Bonfa looked great in their costumes. Ray even had drinks bought for him at the bar. The Irvine Rotary Club has many great projects! We sure did have a lot of fun with this one while helping the 3500 homeless veterans in Orange County. We would like to invite all Rotary Club Presidents to challenge another Club in their district to collect food for organizations in their community. Make it fun and you may even recruit some new members. 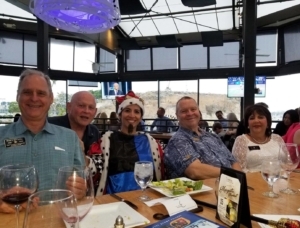 Rotary Club of Irvine’s Anabella Bonfa, Ray Benedickcus and Fredy Dominguez from the Signal Hill Rotary club having fun at our event. How do you get 4 past District governors and Rotarians from 5 different clubs to attend your club event? Provide the best food, wine, music AND tell them that Ray Benedickcus will be attending in drag. 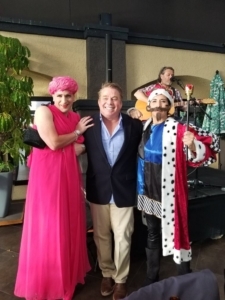 Irvine Rotary President, Ray Benedickcus, Newport Beach Sunrise Rotary’s President, Steve Bender and Irvine President-Elect, Anabella Bonfa pose with Jason Freddy playing in the background. It’s obvious who won the bet. Any challengers for next year?